Dr. Rubiolo obtained his Biotechnology degree from Universidad Nacional de Rosario in Argentina in 2002. He received his Ph.D degree from Universidade de Santiago de Compostela in 2008 were he continued his research up to 2014 in the Pharmacology department of the Veterinary Faculty. 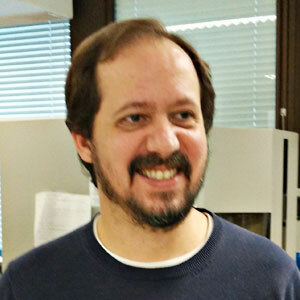 He has extensive research experience in the use of molecular and transcriptomic techniques in the analysis of complex natural molecules mechanism of action, and their potential therapeutic applications. After joining Acuigen in 2015 he is actually involved in several research lines related to comparative genomics, genetic evolution, and zebrafish xenograft model implementation for the evaluation and development of therapeutic lead molecules.